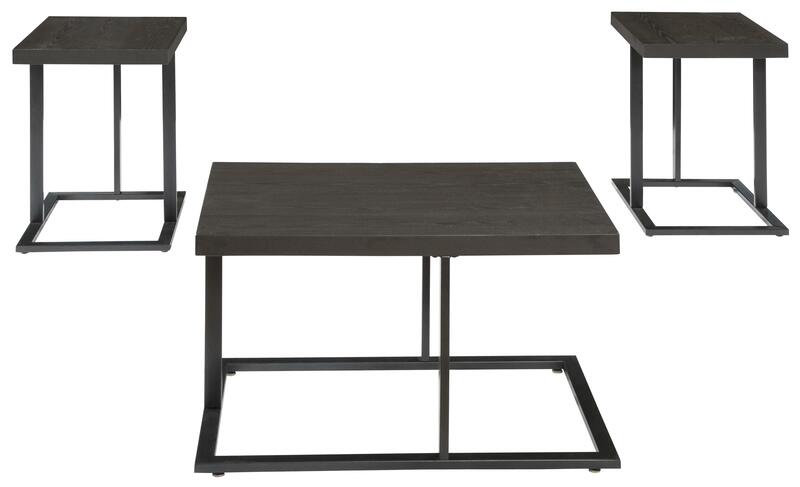 Resolutely modern, with cantilever style aged bronze metal bases, and wire brushed graphite color ash veneer table tops for a rustic design element, this three-piece set of occasional tables makes a stylish impact on the look of your living room decor. The moderate scale of the coffee table and two end tables are perfect, even in smaller spaces. End table (2) 18.00" x 24.00" x 24.25"
The Airdon 3-Piece Occasional Table Set with Modern Metal Bases & Distressed Ash Veneer Tops by Signature Design by Ashley at Michael's Furniture Warehouse in the San Fernando & Los Angeles area. Product availability may vary. Contact us for the most current availability on this product. Case Construction Table frame made with tubular metal and finished in an aged bronze color. Table top made with wire brushed ash veneer finished in a graphite color finish.